That’s a very unusual shot.No wonder the residents came out to gawp! 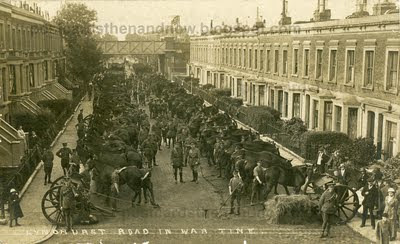 All those horses seemingly ‘parked’ in the road! Wow they sure had a lot of livestock on display! I actually like the building in the past better than what they did today, don't you think? An amazing postcard! The buildings look better then than now (I say that 'almost' every time ;) ). That's a very interesting photo. I wonder whether they were assembled there especially for a photo, or whether there was some other reason. That's an interesting photograph from the time of WWI when it was normal for horses to be on the battlefield. Michael Murpurgo's War Horse is one of my favourite books. The old buildings had much more character than today's. I wonder if this was the only perspective photo taken of this gathering. Surely not. Another wonderful comparison shot where you not only get the pleasure of searching around the old photograph (thanks to the high res scan) but the comparison itself provides a history lesson on changing styles and fashions. I continue to be fascinated by your extensive postcard collection. This one is really spectacular. I am currently reading a book about World War I. It's hard to imagine horse on the battlefield not so long ago. So fascinating to see the past and today images. And it's a wonderful card. Such an unusual sight. What a terrific find. A military logistic photo is much more interesting than a formal posed regimental portrait. It happens that I am presently reading a first rate book on the Great War - To End All Wars by Adam Hochschild. He describes the multitude of horses needed for the war effort, including thousands of cavalry horses that were never used as intended. Most of the poor animals were just consumed in the horrific slaughter. What an amazing sight! But the houses look pretty much the same to me, apart from being repainted. The picture shows a section of the "Camberwell Gun Brigade" the Borough of Camberwell raised the entire divisional artillery contingent for the 33rd Division in 1915 (coincidentally the 39th Division had an artillery train entirely raised in Deptford. These were effectively the artillery equivalent of the more famous Pals Regiments. This photograph probably shows the 162nd Brigade, Royal Field Artillery. 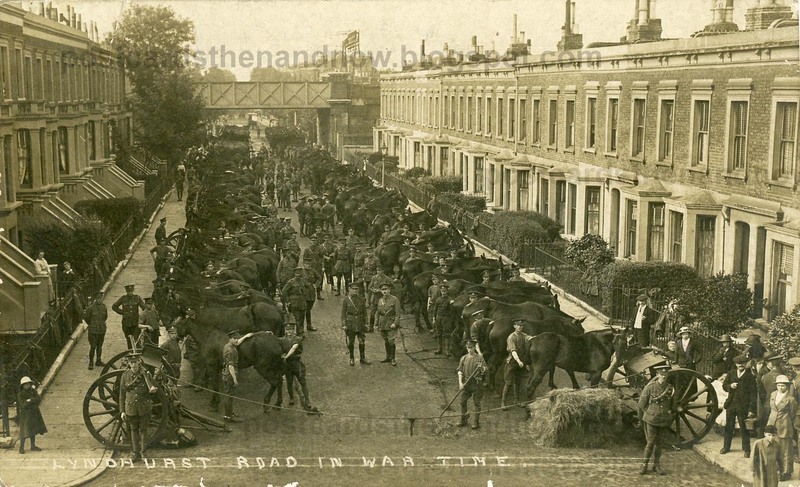 They had originally been billeted in the nearby Gordon's Brewery but a fire had forced them to move out and it was probably then that the picture was taken, although the Camberwell Gun Brigade/Division as a whole suffered from a lack of accomodation for the horses. The Artillery moved to Bulford for final training on Salisbury plane in the August and were sailed for France in the December, just in time for Christmas. My grandfather Arthur Wills and his brother-in law were in the 156th Royal Field Artillery, another brother-in-law was in the 162nd Howitzer Brigade. So I was really fascinated by this photo. I would like to know more about why the horses were here, were they waiting to be sent to France? Amazing picture. I live in one of the houses on the right and we refer to our area as Peckham not Camberwell these days. Fascinating - I guess it is similar to the way that (say) a carnival parade assembles and forms up before parading through a main street. I wonder if there is a write up - perhaps in the Local Press or a published journal or diary that is contemporaneous with the event. That picture has turned up today in Facebook Group "Old Photos of Essex Kent & London"